Hey guys, my wife and I are shifting around boats on our end (even setting up an oar frame on our AIRE Puma raft...hopefully it's not too sacrilege to mention the inflatables), and are back in the market for a canoe. Nova Craft is a favorite of ours and relatively easy to source. We have been choosing between the Pal 16' and Bob Special 15'. - I'll be paddling this solo more than half the time, going on day paddles with my wife quite often, and occasionally tandem tripping, mostly for shorter jaunts (long weekends etc). - I will often be paddling this along the Puget Sound coastline. - I fly fish and want to do some fishing from the boat. Given these considerations we focused on the two boats mentioned above, which both seem awesome, and we think we've made our choice. We are leaning toward the Pal for the narrower beam and presumably better lines for wind (which matters to us), as well as being faster than the Bob. Seems to me that it would solo better and lean easier. -Am I understanding the differences correctly? Last edited by gmb on November 12th, 2018, 3:04 pm, edited 1 time in total. The pal is a small canoe for tandem. That being said, if you and your wife are lightweights, it will suffice. It is not a river runner by any means, you will find it a wet ride tandem in class 2. However, it is a nice big solo. I haven’t paddles a bob so can’t comment. If I were going to buy NC I would just get the 16 foot prospector. Great for two people and not bad heeled to solo. I soloed for 4 days in one. For versatility, it would be the way to go. I’m not sure I like tuff stuff yet, I’ll need a few more years of use to see how it holds up. I have used both regular and expedition. If porting is a concern I would just stick with the regular. I've owned a Prospector 16 before and I liked it, especially on rivers. I'm somewhat open to another one, but honestly I found myself paddling solo more than I expected, and working a bit too hard in the wind when on flatwater which I also ended up paddling more than I expected - a trend that will continue up here on the Sound. I won't pretend I have the best technique, but I do work on it and want to continue to grow. Enter the Pal (and also the Bob, but as I mentioned we're currently leaning toward the Pal). I thought it might be (1) faster in flatwater than both the prospector and bob, (2) less susceptible to wind, and (3) plenty capable of day trips and two to three-nighters with my wife. When we're together, any legitimate whitewater and we'd bring the raft. I hope I can put the Pal (or bob) through an odd class 2 occasionally, but I'm hesitant to base the entire boat purchase off of that scenario. If I were to take the Pal on longer trips I'd set it up as a big solo. One of the considerations was getting a boat that I wont grow out of, skills wise, so to speak. I know the Pal is in the pleasure/recreation model, but I'll admit seeing and hearing Bill Mason enjoy his played an impact on how I view the boat. Rolf's comments and feedback on here also played a role in my thinking behind the boat. All that being said, I'm not trying to convince you why the Pal is right for us, but just offer more info about our current thought process . I don't think you'll find much difference between the Pal and the Bob regarding wind and I don't think you'd find much difference in speed, the Bob is faster than one would think just looking at specs because of differences in hull shape. The Pal will have more load carrying capacity but not by much. Tandem for short trips should be about the same for both. Both canoes would be a bit wet in heavier white water but I've run Class III sections in both if your technique is good. The Bob would be more suitable for fly fishing I would think (basing that on my movements inside the boat while doing photography - I don't fly fish). I don't think you'd regret either canoe. Thanks Rolf! Happy to hear your thoughts on the matter, I've read/seen much of your work on here and Youtube. Hemming and hawing over here, but as you mention they're both well regarded boats. My wife and I like the narrower beam on the Pal (we also talked to the folks at NC this morning and they leaned that direction too for what they termed as "efficiency's sake" ), and if so I guess if we pull the trigger on one I'll have to buck up and try to fish from the pal without falling out . Given that you've put these through their paces - where do you come down on the TuffStuff vs TuffStuff Expedition decision? I like the width of the Bob for solo paddling when heeled over. I also like the V shaped bottom, you can change control a bit by adjust lean. The extra width means you don't have to worry as much about rapping your knuckles in the top hand against the opposite gunnel. The down side to the extra width is that it makes it harder to hoist the canoe over your head for portaging. I'd prefer the Bob if I was doing mostly solo with some tandem and the Pal if I was doing mostly tandem with some solo. I can't give you any advice on Tuff Stuff, mine were Royalex. If you do opt for the Pal, you might like to know NC created their mold from an original Chestnut Pal of mine. And you're dragging us right back into the thick of it! Gah. A good conundrum, though. I did know that about the Pal. Quite cool. https://youtu.be/LhcptGg23dM here's a video of me paddling the Bob solo if you're interested. I dont want to be a party wrecker, but maybe you should give the two canoes a test paddle before buying. Not wrecking the party, and undeniably the best approach. Trying to find a way to pull it off in the PNW . Good advice. It is hard to apply someone else's experience with a canoe to your own situation. The two canoes you are interested in are good performers in their class but there isn't a lot of leeway regarding how much you can load into them without compromising performance or safety. 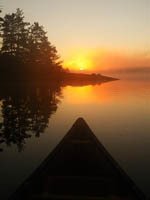 You can get some broad guidance by asking others but the only way you are going to know for sure you are picking the right canoe is to try it in circumstances that match what you are going to use it for. About loading up and max capacity... there are calculated upper and lower load numbers given for the Bob's over at Bear Mountain Boats... also stability numbers in a relative sense. Just paper numbers and calculations, YMMV, maybe something to start off with for comparison. I agree with the above, canoe choice seems to be subjective in terms of individual choice, it's hard to predict what any individual's preference will turn out to be, esp over the long term. Yes, test-paddle if you can... some smaller tandems won't be wide enough for comfortable sitting or kneeling and won't be a good choice for larger-bodied paddlers on longer trips. The Pal maybe has the edge here for flexibility since it is the larger canoe and there might be more room to be comfortable in, if for example, the seats need to be moved towards the center to provide more room for feet and knees. Or, if on a long trip, there's the need for more room for more gear. If you have any tools or access to tools, you could build a tandem and dedicated solo cedarstrip for well under 2000 bucks, just say'n, lol. Been following this thread for a while and thought I'd chip in my 2cents Canadian. While I can't speak for Nova Craft, I can speak with some knowledge of the 3 models mentioned as I have a green Chestnut Bobs Special, a red 16' Chestnut Pal and a chestnut grey 16' Chestnut Prospector Fort. I can affirm that while each is a delight to paddle, they are very different and serve different purposes. I can also confirm that I've paddled each both solo and tandem many times. From my perspective, the most fun paddling solo is the Bobs. Not fast, but incredibly stable and maneuverable especially heeled over on its side. A fun tandem paddle too but not enough capacity for more than a day trip. The Pal is my go to for both tandem and solo tripping- it has the capacity to take 2 grown adults and all their gear, its light enough to portage easily and paddles easily, tracks well. The Prospector is a workhorse. It has highest capacity and is the heaviest of the 3 weighing in at 78lbs dry! For an extending wilderness trip, this would be the boat to take but until it is well loaded it rides high and is a challenge to solo, especially in any wind. Not impossible, just takers work. If Nova Craft have molded their boats on Chestnut hulls or forms I'd assume relatively similar capabilities and handling. So looking for a good allround tandem boat you'll solo often, I'd opt for the Pal.